Skippy plunged into the center of the hurricane and he began to swim. He swam as fast as he could in circles going the opposite way that the hurricane was spinning. The hurricane struggled to keep turning, but Skippy was too fast. The whirling tower slowed, stopped, and collapsed back into the sea, admitting defeat. Everything was calm. Skippy saw the little boat not far off, still upright and still in one piece. He eagerly swam over to meet the passengers. 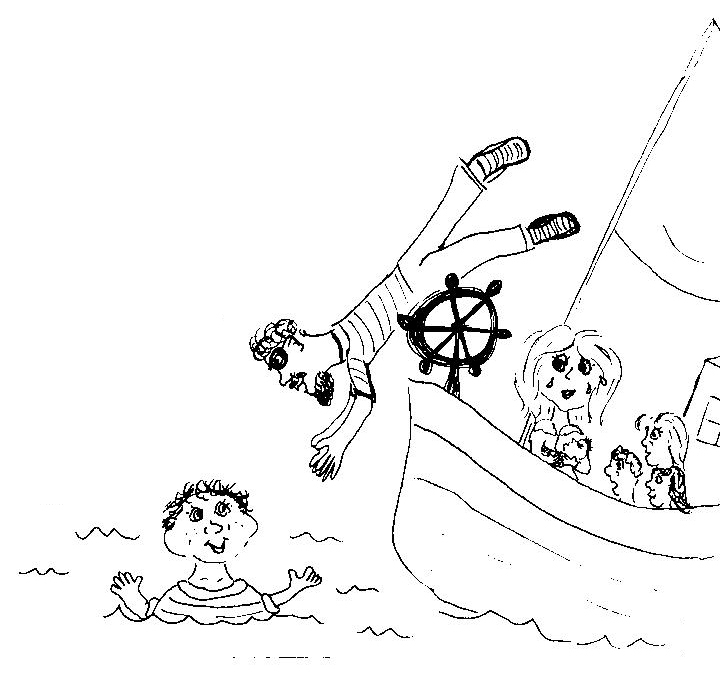 When he reached the boat, he saw six faces staring down at him. The mother had red hair and sea-blue eyes. The father had red hair and sea-blue eyes. And the four children had red hair and sea-blue eyes. “Skippy? ?” yelled Mr. Fishback as he dove into the water to hug his son. Mrs. Fishback simply burst into tears. Mr. Fishback brought Skippy on board and set him on the deck. Skippy took one step and fell over! You see, he had never learned to walk. “Skippy, I’d like you to meet your brothers and sisters,” said Mrs. Fishback proudly with tears glistening in her eyes. The Fishback children stared in wonder at their big brother with the glittering turtle shell. “Do you like it?” asked Skippy. “Would you like to try it on?” He slipped out of the shell and let his siblings admire it. At this, Mrs. Fishback spun around. Her eyes were bright. “What did you say?” she asked excitedly. Of course, the answer to Skippy’s question was an enthusiastic “YES!” so Skippy lost no time in finding all of his new friends to introduce to his parents. He brought Sally the Sea Turtle, Bouncer the Bouncing Fish, and Raymond the Tickle Ray all back to his parents, who were overjoyed to meet these incredible undiscovered species. Then Skippy remembered the promises he had made and he presented the shark tooth to Sally, the golden fish hook to Bouncer, and the pirate flag to Raymond. And everyone was happy. So what happened next, you ask? Well, Mr. and Mrs. Fishback became famous for their new discoveries and they were able to afford a much bigger, better boat for their family. It even had a swimming pool! Skippy taught his little brothers and sisters how to swim, because none of them knew how. You see, after what happened to Skippy, Mr. and Mrs. Fishback were terrified to let any of their other children near the water. But now that Skippy was home, they decided it was about time that their young Fishbacks learned to swim. And it was about time that Skippy learned to walk! Of course, they couldn’t keep him out of the water for long. He still spent most of his time in the ocean, taking his younger siblings for bouncing rides, looking for new species of sea life to show his parents, or just swimming and visiting his friends. But he always returned to his family. Go to the Chapter 4 worksheet.